Have specific activities that you'd like to record at your center? 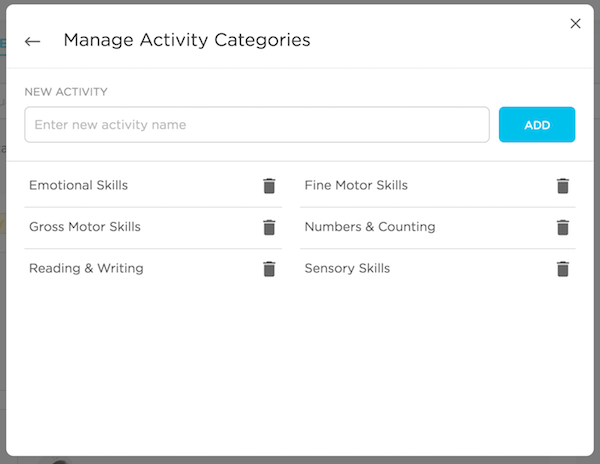 Use our Learning activities option to create a customized list of activities that you do on a daily basis and would like to record. These can be sent as daily updates for parents to view or recorded with the "staff-only" option enabled to internally track a child's progress and development. 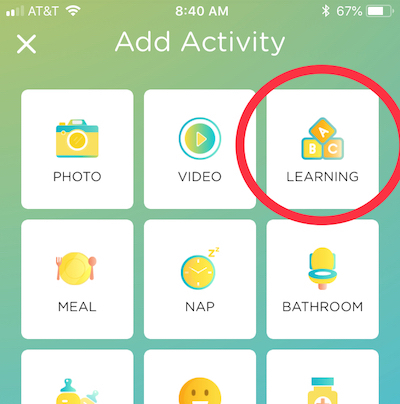 "Learning" can be used to record activities aimed at the children's overall development and growth, or to record any daily activity that does not have its own button on our app. 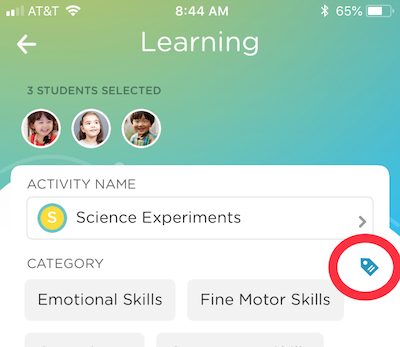 Learning Activities will eventually be connected to a Lesson Planning feature on our website, but for now they can only be recorded in the app. This is the title of the activity. 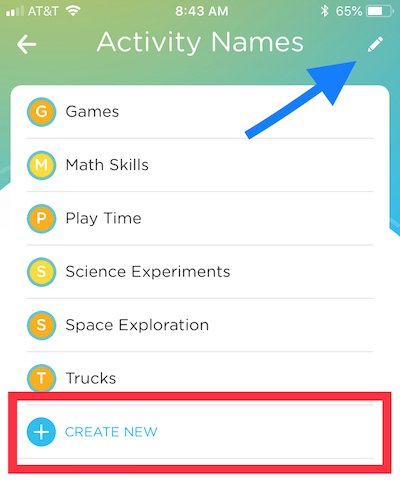 This title will appear on the activity update in the child's daily activity feed, along with any descriptions or pictures you choose to record. Examples include: Circle Time, Play Time, Quiet Time, Sensory Exploration, Art Time, Silent Reading, or Math & Science. This is a specialized tag that you can add to your learning activities. These can be customized to indicate specific developmental skills that you want the activities to address. Examples include: Literacy Skills, Math Skills, Social-Emotional Skills, Fine Motor Skills, and Gross Motor Skills. Open the app and click on Activities from the Home Screen. Select the Learning activity option. Select any child (if you're not actually recording an activity at this time) and continue to the main activity screen. Click on the Activity Name section to view and edit activity names. 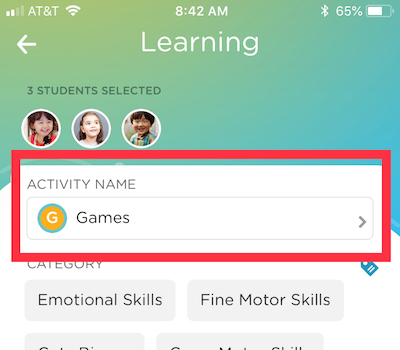 You will be able to create new activities (highlighted in red), or click on the pencil icon (indicated by the blue arrow) in order to edit the names of your activities or delete them altogether. Once your activity names are all set, you can choose the one you want to record, or go back to the main activity screen to continue. To customize your categories, click on the tag icon (indicated in red above). From there, you will be able to click on the trashcan icons to delete a category, or create a new category (in the same way you created new activity names). Note: There's no way to edit a category name once it has been created. You'll need to delete it and create a new one with the corrected name. Click here to see how to Create / Edit Activities on the website. 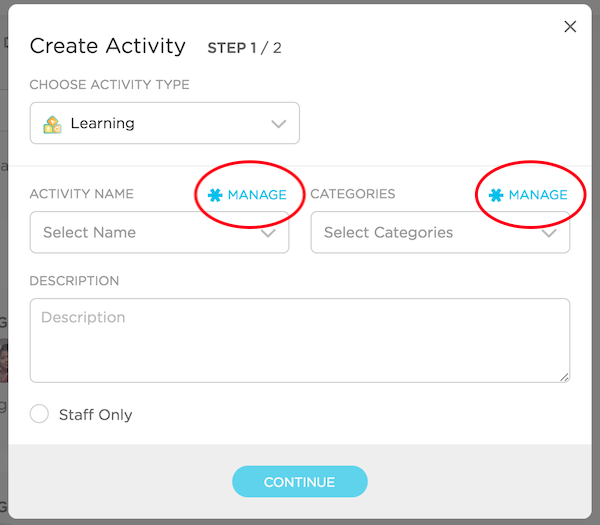 While creating a learning activity, click on the "Manage" buttons to add or delete activity names and categories.